Plastic Man swallowing Metamorpho and Mister Terrific in The Terrifics #1. Imagine a world in which reporting has been replaced by infotainment produced by journalists with head-mounted broadcasting devices, who race on foot to crime scenes trying to be the first to upload reports of what went down. It’s depressing to contemplate what sort of impact this would have on the public’s perception of reality—but you know what’s even more horrifying to think about? Lovecraftian monsters, that’s what. It’s time for The Pull List. The great thing about noir as a genre is that even though there’s a very particular kind of aesthetic and storytelling structure required to make something proper noir, it has an almost endless potential to be cleverly adapted to fit within different sub-genres. JSB’s It Looks Back from Caliber Comics is very much your traditional noir tale, complete with a hardboiled detective type, a strange murder mystery, and a dreary backdrop largely devoid of color. But it twists itself into a fascinating deconstruction of the genre by introducing an element of the supernatural into the mix that throws private investigator Brennan O’Sullivan off his A-game. When a well-respected journalist turns up dead from an apparent suicide, Sully begins to dig into the deceased’s personal life, only to find that he seemingly had no reason (that anyone knew of, at least) to kill himself. What Sully discovers during his investigation, though, is that the dead journalist shared a strange connection to the occult and his tortured spirit is still very much bound to the mortal plane. What’s impressive about this first issue is that the Lovecraftian creatures which are soon to put Sully’s life in danger are completely absent, but It Looks Back still creates an atmosphere of death and dread that perfectly sets the stage for the horrors to come. Vita Ayala’s The Wilds, from Black Mask Studios, will remind you of a number of other post-apocalyptic horror stories about a world where humans fight for their lives against hordes of unfortunate souls who met their ends thanks to a mysterious disease that quickly decimated the population. But unlike most other zombie stories that emphasize the grim, bloodiness of the apocalypse, The Wilds does something novel and portrays the infection that ravaged the world as something that’s as beautiful as it is dangerous. The world of Keith Carmona’s Blank is a lot like our own. Nearly everyone is in the media business thanks to tiny devices they carry with them at all times, and because everyone’s an active participant, the idea of what counts as news has drastically changed. Plastic Man realizing that he’s standing on the planet-sized body of a dead alien. There’s really no way to talk about DC’s new series The Terrifics without comparing it to Marvel’s Fantastic Four. Not just because both teams are led by brilliant super-scientists, or that they each feature a hero who can stretch and mold their bodies into odd shapes—it’s also that they’re both fundamentally stories about unconventional families. Rather than telling the origin story of how a nuclear family of relative normal people become larger-than-life heroes, The Terrifics assumes that you’re already familiar enough with its cast of characters to be comfortable with seeing them thrown together almost immediately. Following the events of DC’s ongoing Dark Knights: Metal, The Terrifics finds Mister Terrific still cleaning up Bruce Wayne’s messes. With the world now aware of the existence of the Dark Multiverse, yet another person wants to open up a portal into it, something that would surely imperil the prime universe once again. When Mister Terrific shows up on the scene to investigate the newest doorway into the Dark Multiverse, he’s shocked to learn that Metamorpho is being used as a key of sorts to keep the gateway open. While trying to close the door, both Terrific and Metamorpho are sucked through the door, and it’s only because Terrific thought to bring the newly-awakened Plastic Man along with him that the costumed heroes are able to survive the journey. 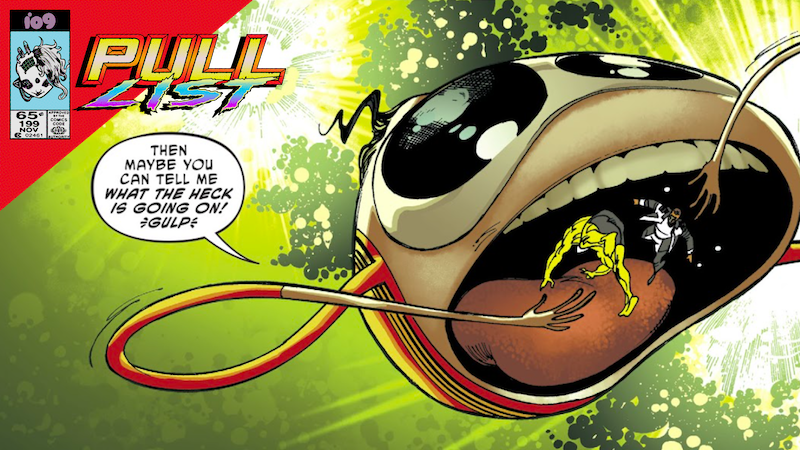 The Terrifics gets into straight-up Kirby territory the moment its heroes step through that portal and meet the long-missing Phantom Girl, who’s been trapped on the gargantuan corpse of a dead alien hurtling through space. More than anything else, it’s that kind of out-there weirdness that makes the first issue feel like it’s such a strong spiritual successor to the Fantastic Four—as well as a straight-up fun comic to read in its own right.